Very warm, made of the highest quality cotton sweatshirt with a hood. Its advantage is a large, zipped pocket, in which you can warm up your hands. In addition, its sleeves have thumb holes in cuffs that also protect your hands on cold days. The sweatshirt is decorated with prints on the sleeve, hood and on its side. There is also woven badge with logotype on the chest. 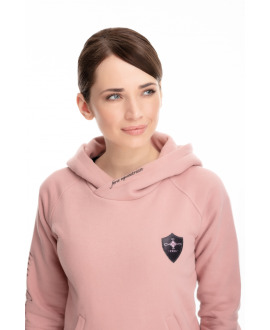 The sweatshirt perfectly matches our Davos tracksuit bottoms, creating a set of comfortable clothes for active people.